A grieving husband claims his wife accidentally fell to her death. Investigators become suspicious after learning his first wife also died in a freak accident. An exclusive look into the dark world of contract killings. 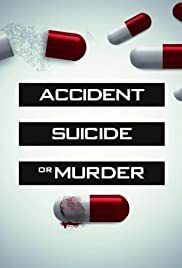 "Accident, Suicide or Murder" explores the unbelievable true stories of suspicious deaths. Each hour-long episode retraces the investigation from start to finish, taking viewers through the twists and turns of these shocking cases, from dissecting the red flags to the undeniable evidence, and strange behavior that put the tragedy in question. This is decent but a bit deceiving in a sense that there are already 4 episodes out and it seems to be the same outcome for each one, so far. On Season 1 Episode 4; I have seen this exact story on at least 10 other documentaries. Someone is getting paid bank for another's suffering for sure.